Although green tea is one of the most actual lately, black tea is tea that has a long tradition and confirmed quality. Black tea is among the top selling herbs in the Western countries and as the scientists prefer to say it is the “born brother” of green tea because both come from the tea plant Camellia sinensis. Except green and black tea, white tea is also obtained from this herb. All three types of tea have great impact on the body. Black tea compared with his “brothers” contains the largest amount of caffeine. It means that this tea is an ideal substitute for coffee and energy drinks. The healing properties of black tea were examined on many occasions. It tea is a good option to include as a part of your diet because of its several health benefits, most of which can be attributed to its favorable nutritional profile. Due to increased oxidation, it has more flavor and caffeine than its other counterparts. Moreover, the flavor of the tea can be retained for a much longer time than the other teas. The benefits of black tea for the health are given below. Heart Health – A research was done on the Boston University School of Medicine which included a group of patients who had heart disease and had to drink four cups of black tea a day, while the control group also consisted of patients with heart disease that should not drink black tea. After a month the university examinations showed that patients who drank black tea showed a 50% improvement in the cardiac health and blood vessels compared with those that did not consumed the tea. Also the group of high-risk patients for heart attacks was in the group of patients with moderate risk. Boosts the Immune System – A strong immune system is necessary for fighting the bacteria and viruses that can cause illnesses. Black tea contains substances called ‘tannins’ that have the ability to fight viruses such as influenza, dysentery, hepatitis, cold, and flu. One such tannin called ‘catechin’ helps in suppressing tumors. The alkylamine antigens in black tea boost the immune response. Drinking 3 to 4 cups of black tea each day helps in lowering inflammation and eliminates harmful pathogens. Cancer Prevention – The antioxidants, called polyphenols, found in black tea help in preventing the formation of potential carcinogens in the body, resulting in the prevention of certain cancers like ovarian, lung, prostrate, colorectal and bladder cancers. Studies have revealed that black tea is effective in preventing stomach, prostate and breast cancer. Black tea contains a compound called TF-2 that is responsible for causing apoptosis (programmed death of cancer cells), while the normal cells remain unaffected. Additionally, it can also significantly reduce the risk of oral cancer in those who smoke cigarettes or use other tobacco products. Black tea also prevents cancer by inhibiting the formation and growth of malignant tumors. Boost the Brain Function – Except for improving cardiac function this tea is excellent for improving the brain function and the function and health of the lungs. Scientists say it is a great drink that you should use in a period of physical and mental activity, because it provides concentration, energy and improves the reflex, making it favorable drink for drivers. Helps with Asthma – Hot and brewed liquids, in general, bring relief to asthmatic conditions. In light of that fact, it is no surprise that this tea is extremely beneficial for asthmatic patients, as it expands the air passage, thereby allowing patients to breathe more easily. Relieves Stress – We all are aware and well experienced about the calming and relaxing benefits of this tea. 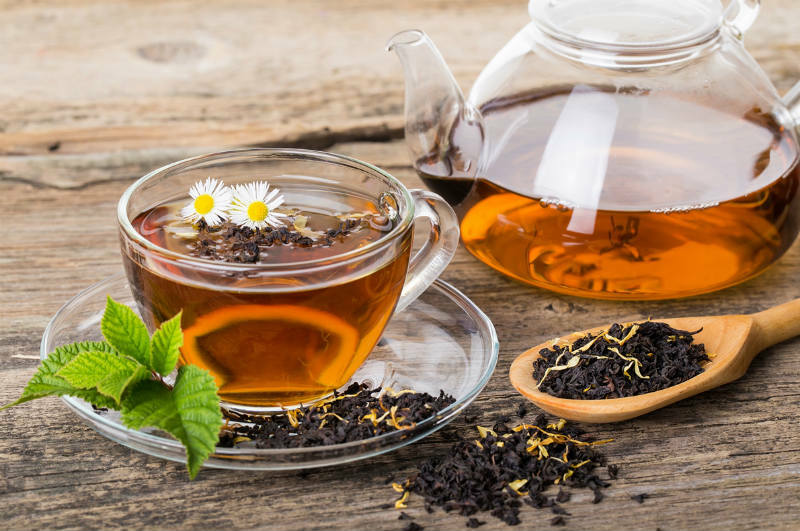 Not only does it help slow you down after a long day, studies show that the amino acid L-theanine found in black tea can help you relax and concentrate better. This tea has also been shown to reduce levels of the stress hormone cortisol when consumed in moderate amounts on a regular basis. More facts can be written black tea, we wrote only its basic characteristics. If you are currently wondering whether to drink green or black tea, we will answer you. It is your choice; both teas are great for the health. The only thing we have to mention is to be careful not to enter excessive amounts of this tea, because the caffeine in large quantities has a detrimental effect on the health. Four cups of the tea spread throughout the day for people who are sensitive to caffeine is an excellent choice.